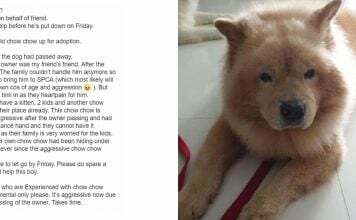 Remember the times you had spent running around void decks playing with friends, getting your hunger pangs fulfilled at the ‘mama’ shop near your school, or just sitting around watching the moonlight at night before bed as a child? Those memories may be past, but did you know that you can relive them through art? 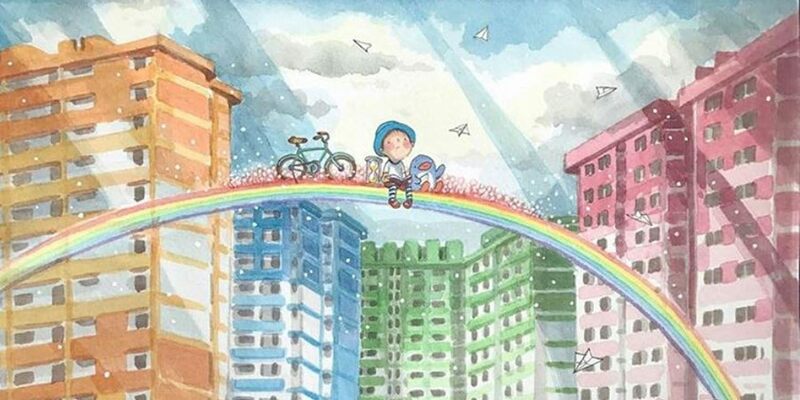 Singaporean artist Lee Kow Fong, more fondly known as Ah Guo (阿果), aims to do just that by painting colourful illustrations that take inspiration from the heartlands we’re all so familiar with. Taking the characters of children as well as various animals such as penguins, hedgehogs and rabbits, he paints them in childlike fashion to appeal to both young and old. Here are 7 of his paintings in iconic Singaporean style. Have a go at how many of these places you recognise! 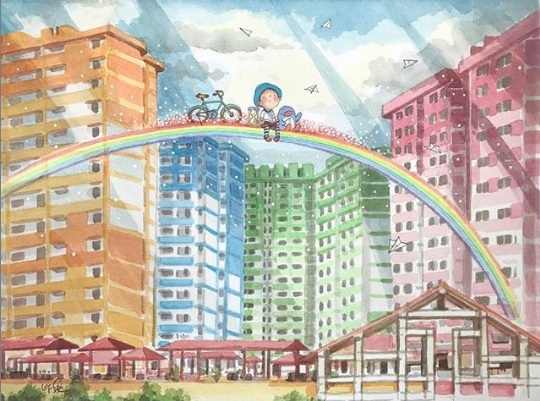 Set against the backdrop of Bishan New Town, this painting has a special significance for Ah Guo as it marks his one-year anniversary of being a full-time illustrator. 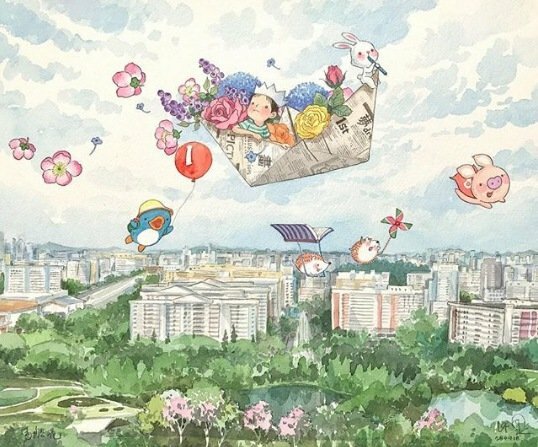 Just like how the characters in this painting are taking flight in a little newspaper boat, Ah Guo hopes it will serve as a motivation and reminder for him to aim for greater horizons in whatever he’s doing. Featuring the iconic Ngee Ann City building along Orchard Road, Ah Guo contributed this exclusive illustration for Takashimaya Singapore’s 25th anniversary in 2018. 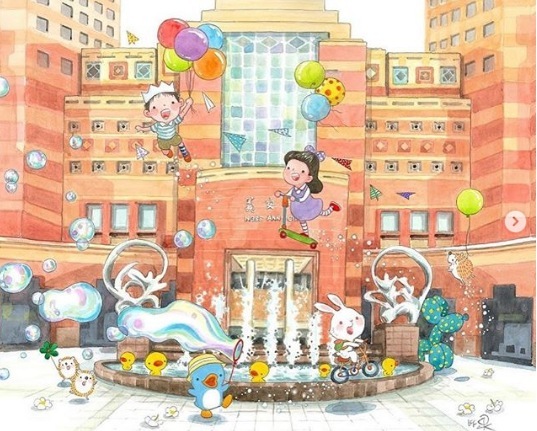 In this painting, children play in harmony at the water fountain with animals such as ducks, hedgehogs, a rabbit and a penguin, which is also one of Ah Guo’s favourite animals. Ah, the childhood times when even simple things like a water fountain could make us so fascinated. When it was announced that the Rochor Centre public housing estate would be demolished in June 2018, photographers from all walks of life came to catch a shot of the four distinctly coloured buildings before its impending fate. While the hues of yellow, blue, green and red are now a thing of the past, let’s take pride in its numerous angles of beauty we have collected – such as in this painting – that we can showcase for generations to come. 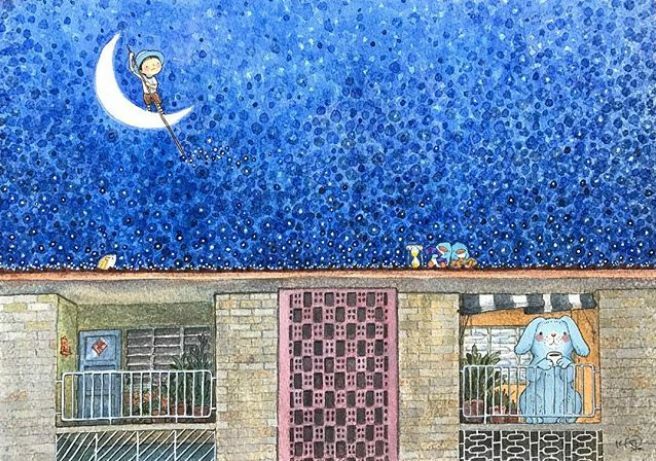 This painting was for a nursery rhymes project initiated by The Threatre Practice in 2016, in which Ah Guo depicted his idea of a “little white boat” — a crescent moon. The building as seen above was inspired by one of the old Dakota flats. We may be all-too-familiar with local provision shops – or ‘mama’ shops as we fondly call them – that are very conveniently located in our neighbourhoods for a quick fix when our hunger pangs kick in. 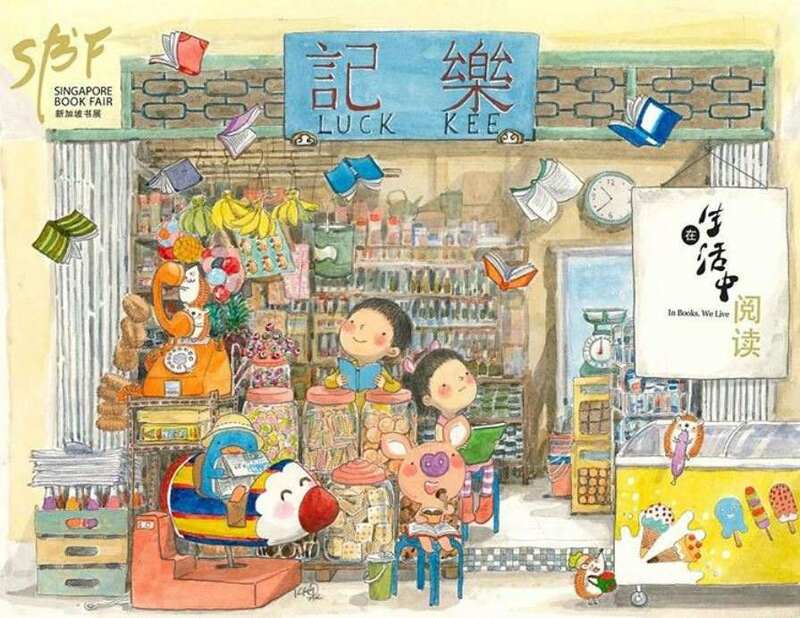 In this painting, Ah Guo combines different visual elements of local provision shops into one image. Visitors to and residents of Toa Payoh are sure to be no stranger to this iconic dragon playground which has come to be known as part of Singapore’s heritage. 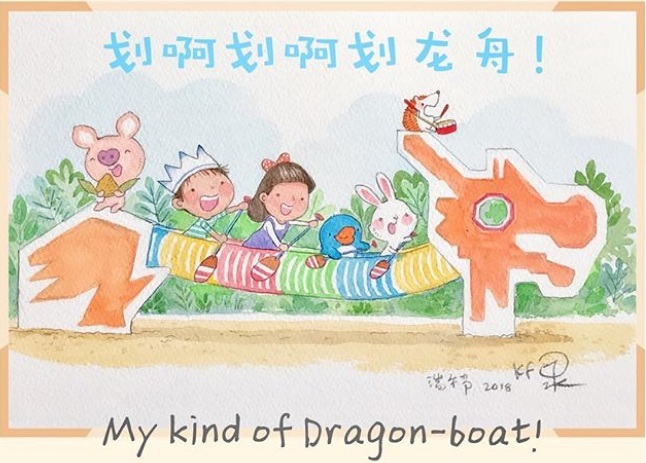 Ah Guo drew this in 2018, coinciding with the Dragon Boat Festival. The pig in the painting can even be seen enjoying a bean-paste dumpling! This painting is actually the main visual for the 2018 Xinyao (新谣) singing and songwriting competition, titled 新空下. 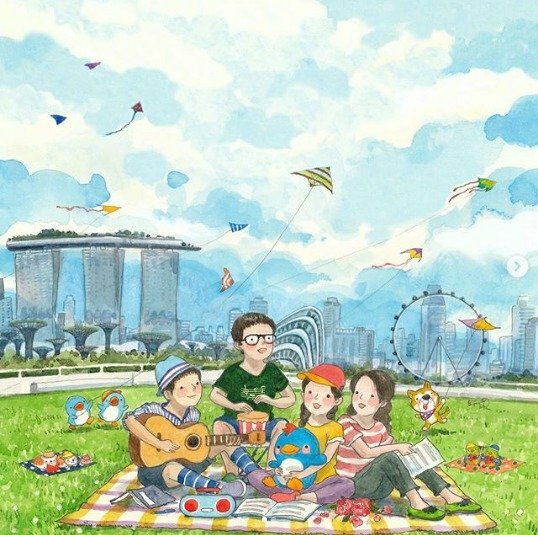 In it, a group of friends enjoy the company of music with the Marina Bay skyline in the background, featuring Marina Bay Sands, the Singapore Flyer and Gardens By The Bay. If you have been touched by Ah Guo’s illustrations and would like to see more of his works up close, we have some good news for you! 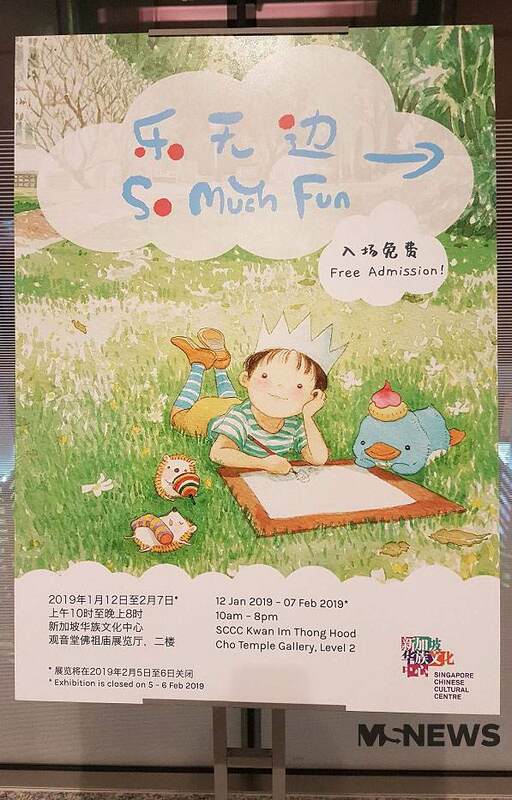 This year, as he is celebrating his 10th anniversary as a home-grown illustrator, he will be holding a exhibition at the Singapore Chinese Cultural Centre (SCCC) titled “So Much Fun” which will also coincide with Chinese New Year (CNY) celebrations. 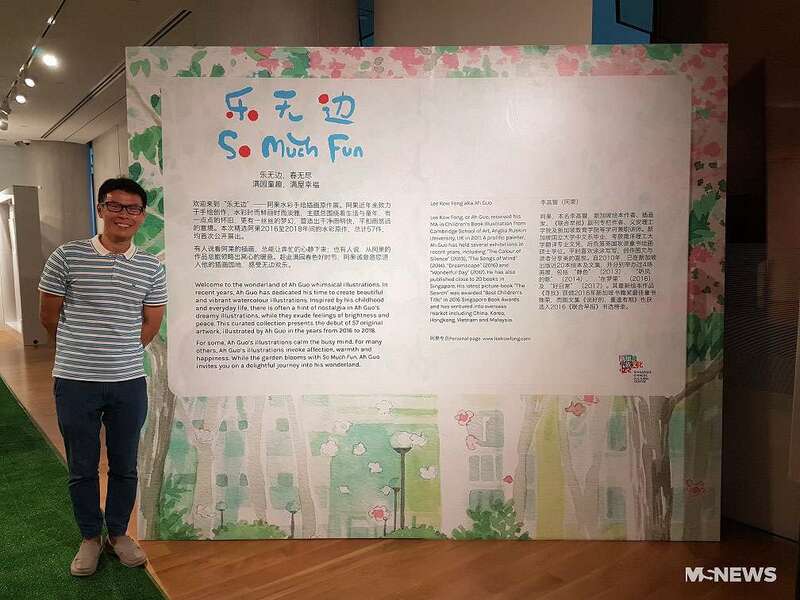 The collection will debut over 50 of his original artworks from 2016 to 2018, including a large cardboard house featuring a life-sized yusheng painting. 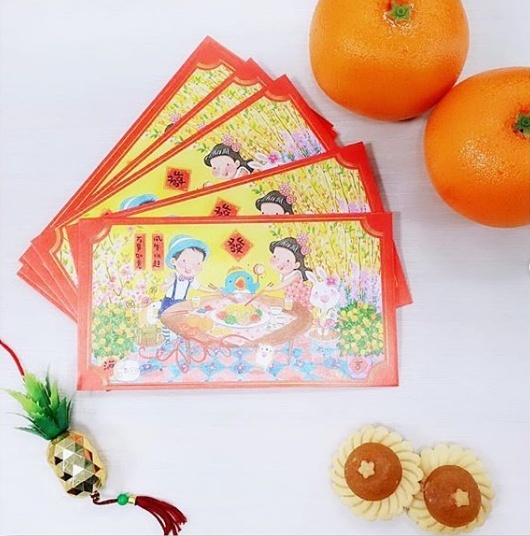 In addition, you may also be able to walk away with a set of “singing” red packets – a collaborative effort by Ah Guo and pianist composer Peng Chi Sheng. The red packets feature a beautiful ‘yusheng’ painting and a catchy Chinese New Year tune titled “The Lo Hei Song”.